I've just returned to Minnesota after 12 days of travel: a week at California Brazil Camp in Cazadero (Sonoma County), and a few more days visiting relatives in the San Francisco Bay Area. For some reason I thought I'd have time to get onto (scarce) wifi and post something while at camp (ha!) Then I came home and got sucked into fall planning for my students - lessons start up tomorrow! It's a beautiful music camp in the middle of a redwood forest, where cell phones don't work, so instead of walking around with necks craned downward, we are present and greeted by each others' faces. This was my 5th visit, but no matter how many times you go, you can expect to have your head filled to the brim with all of the new music you can absorb, as there are 8+ hours of possible classes each day, and jams or concerts in the evenings that last much of the night. How to describe the vibe of California Brazil Camp? Some are religious in their commitment to coming every year, and their fanaticism for the music. The vast majority of people who come there are open, friendly, and interesting, and the level of trust is almost instant - people leave out electronics and personal belongings, and I’ve never heard of anyone having something stolen. Mostly we’re all just so excited to be among our people, doing what we love, surrounded by phenomenal teachers and fellow students. Until you've been there, it’s hard to understand the effect of the near-total immersion in Brazilian music that we get at this camp - I always come home walking to some kind of samba beat stuck in my head and think that music I hear from afar is Brazilian (sadly, it usually isn't). Even saying “Brazilian music” is overly general - many genres are studied: samba, Brazilian jazz, choro, forró, baião, frevo, xote, bossa, etc. I think that I played some of all of these during the week, which would explain why my brain always felt in danger of exploding from fullness. I always bring a melodica to camp with me, in case there are too many pianists, but this year there was both a piano and a keyboard in the rehearsal room, so I always got to play one of the two, which was incredible. I also tried out the beginning vocal class for a few days, and didn't even have any time for percussion. The hardest decisions to make at camp are which classes not to take, and how much to sleep/how much jamming time you're going to miss (many of the amazing teachers stay up most of the night, and no one wants to miss the opportunity to see them or even participate!) Squeezing any extraneous practice time into your schedule is also difficult, especially for a pianist - limited instrument choices. I'll save more of my reflections and takeaways for the next post - re-entry into real life takes a while. 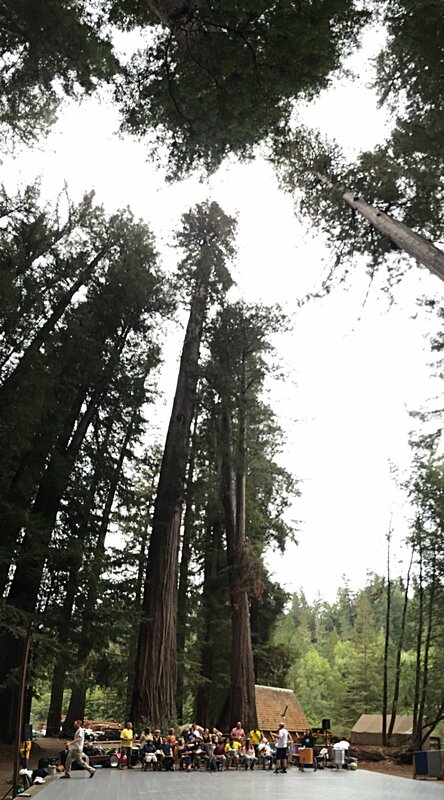 For now, enjoy the tunes and views of the incredible redwoods.